For other uses, see White Stag. A white stag (or white hind for the female) is a white-colored red deer or fallow deer, explained by a condition known as leucism that causes its hair and skin to lose its natural colour. The white deer has played a prominent role in many cultures' mythology. Leucism is a rare genetic pattern that causes a reduction in the pigment of an animal's hair and skin. The natural colour of the red deer ranges from dark red to brown. They are often thought to be albinos; however, unlike albinos, who have characteristically red eyes, deer with leucism have normal colouring in their eyes. It is distinguished biologically from albinism in that it causes a reduced pigmentation in all skin types, and not just melanin. White deer hold a place in the mythology of many cultures. The Celtic people considered them to be messengers from the otherworld; they also played an important role in other pre-Indo-European cultures, especially in the north. The Celts believed that the white stag would appear when one was transgressing a taboo, such as when Pwyll trespassed into Arawn's hunting grounds. Arthurian legend states that the creature has a perennial ability to evade capture, and that the pursuit of the animal represents mankind's spiritual quest. It also signalled that the time was nigh for the knights of the kingdom to pursue a quest. In English Folklore, the white hart is associated with Herne the Hunter. 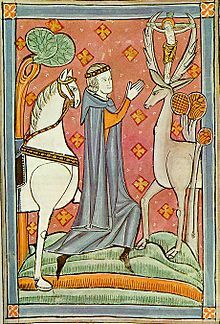 In Christianity, the white stag was partly responsible for the conversion of the martyr Saint Eustace. Eustace saw a vision of Christ between the stag's antlers and was told that he would suffer for Christ. A similar legend is associated with Saint Hubert. The White Stag has a message for you. Hunters of old pursued the miraculous stag, not because they expected to kill it, but because it led them in the joy of the chase to new and fresh adventures, and so to capture happiness. You may look on the White Stag as the true spirit of Scouting, springing forward and upward, ever leading you onward to leap over difficulties, to face new adventures in your active pursuit of the higher aims of Scouting. Miniature of the hunt of the White Stag, with Hunor and Magor in the foreground, 1360. Today, the Hungarian branch of Scouts uses the white stag as a symbol. The white stag is also prevalent in Hungarian mythology; it was believed that a white stag led the brothers Hunor and Magor to Scythia, an action which preceded the formation of the Hun and Magyar people. The White Stag Leadership Development Program bases much of its spirit and traditions on the white stag of Hungarian mythology. The colour white has long been associated with purity; and in Celtic culture, the colour also represented the otherworld. In modern society, people have acted to protect the white stag as a vestige of beauty, and the hunting of the white stag has often met with anger, because of its rare and elusive nature. For early man, the deer resprented a valuable resource, providing nourishment, clothing and other accessories; and the deer may have played a role in totemic culture. In Guigemar, one of the twelve Lais of Marie de France (supposedly based upon tales of the Celtic Bretons), a white doe with antlers appears as an omen to the titular character. The white stag of Hungarian mythology was the subject of a children's book of the same name. The White Stag by Kate Seredy won the prestigious Newbery Medal as the Outstanding American book for children in 1938. This story describes the leadership of Attila—known by history as Attila the Hun, the "Scourge of God"—in their pursuit of a mythical white stag that led them to a new country and home. A white doe is featured in the fairy tale The White Doe by Madame d'Aulnoy. A princess is transformed into the titular white doe as per a fairy's curse. William Wordsworth's The White Doe of Rylstone is partly based on a legend of a white doe making weekly pilgrimages to Bolton Abbey. A white doe in James Thurber's whimsical fairy tale The White Deer is transformed into a young woman when trapped by hunters, but her only memories are of fields and trees so no one is sure if she was originally a deer or a princess. The white stag played an important role in C.S. Lewis' The Lion, the Witch and the Wardrobe novel. The Pevensie children (now grown-up kings and queens) hunt the Stag, hoping to gain wishes for catching it. It is in their pursuit of the Stag that they stumble back through the wardrobe and into their own world, returned to childhood. At the beginning of the story, the character of the White Witch appears in a sleigh drawn by two white reindeer, but there is nothing in the story that suggests they are connected to the White Stag, which is referred to by name in its chapter. The white stag makes an appearance in The Elder Scrolls V: Skyrim, in which a large white stag is hunted as part of the quest "Ill Met by Moonlight". The Myth of the White Stag is the theme of the second episode in the second season of the Black Butler anime. The White Stag makes an appearance in Harry Potter as a Patronus Charm used by Harry Potter's future self to guide Harry. Harry's father is also known to use the same Patronus. The White Stag, known as Malorne, is a demigod of nature in the Warcraft series of PC games. It appears before the moment that the hero meets the Dryad in the PC game Quest for Glory. The White Stag is a rare animal that can be hunted in an event chain in the game Crusader Kings 2. The White Stag is also used in the films Snow White and the Huntsman and The Hobbit film series. Blanche Noir, an anthropomorphic white stag, is a character in the fantasy webcomic Skin Deep. ^ a b c d e f Jones, Mary (January 15, 2008). "The White Stag". Retrieved 2010-04-08. ^ "Ghost-like white stag spotted in Scotland". Reuters. 2008-02-12. Archived from the original on 2011-05-20. ^ "St. Hubert". Catholic Encyclopedia. Retrieved 24 April 2017. ^ Fox-Davies, Arthur=location=London (1909). A Complete Guide to Heraldry. TC & EC Jack. ^ Ashe, Laura (2016). Richard II (Penguin Monarchs): A Brittle Glory. Penguin UK. ISBN 9780141979908. Retrieved 8 September 2017. ^ Orans, Lewis P. (2007). "Follow the White Stag" A Special Heritage". The Pinetree Web. Archived from the original on 1998-02-16. ^ "'Disgust' over white stag death". BBC News. 2007-10-26. ^ "Rare white stag found shot and beheaded". The Telegraph. 2007-10-27. Archived from the original on 2007-10-27. Wikimedia Commons has media related to White deer. This page was last edited on 22 April 2019, at 16:07 (UTC).